Posted on November 7, 2015 Author admin Comments Off on the Ailey Spirit Gala – choose your favorite from these 10 looks! For your Sunday style inspiration this week, enjoy these looks from the Ailey Spirit Gala in New York. Pamela Zilly looks gorgeous in a multicolored dress. Lovely combination of pink and white with gorgeous shoes. A unique black and white ensemble accessorized with red. I love the color of this suit and the way this lady combined it with a textured bag and red top. A very elegant dress paired with pumps makes for a great summer look. You can never really go far wrong with a little black dress. 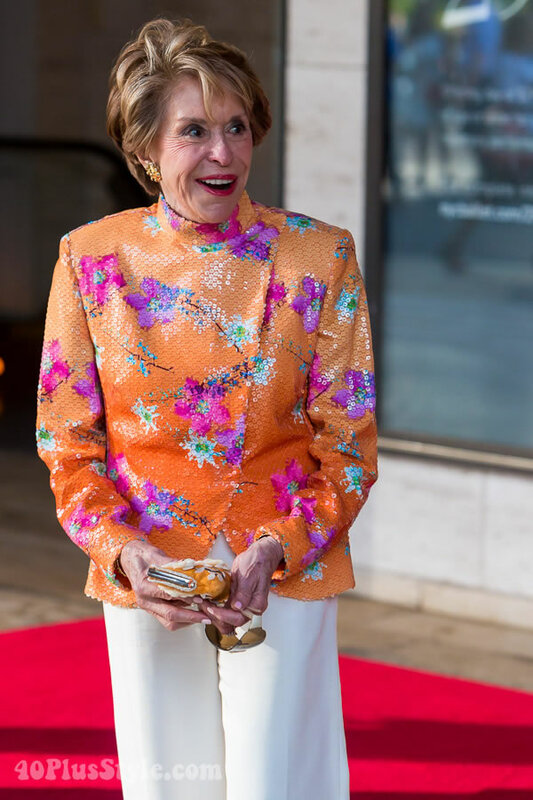 This is Joan Weill and the colors of this fabulous party jacket suit her so well. I love how this family embraces color. The woman in the red and black dress looks especially fabulous. The oversized top half of this dress makes it very unusual and interesting. She certainly has the legs to carry this look. This is a more artistic look enhanced by the oversized necklace. I love the diversity of all these looks and like them all, but the top look by Pamela Zilly is my personal favorite as I love the colors and print of that dress which suit this woman perfectly. A navy blue draped dress for hot summer weather! Fun and games in The Netherlands and what we wore! How to pack for a 3 month trip?